Volvo. The name is synonymous with safety and durability, and for years it was also synonymous with cars that looked like cinder blocks on wheels. Those days are now long gone, fortunately, and the recent crop of Volvos has been as pleasing aesthetically as they are technologically. This has undoubtedly helped the Swedish company remain competitive in an increasingly crowded automotive marketplace, and if my experience with the 2005 S40 sedan is any indication, the company will be doing quite well for the foreseeable future. 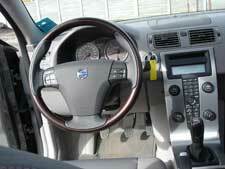 The S40 is Volvos entry level vehicle, a four door sedan available in a variety of configurations. My test unit was the T5 AWD, which is the higher end version and it came with enough extras and gewgaws to move its price tag from the S40s base of just under thirty grand Canadian to just under fifty thousand Canuck loonies. Not cheap, but not out of the ballpark, either, considering what you get. Take the engine, for example. The T5 label indicates that this S40 includes a hot, turbocharged and intercooled inline five cylinder power plant with variable valve timing. Its rated at 218 horses @ 5000 rpm and 236 lb. ft. of torque, numbers that dont seem excessive at a price point where six cylinder-equipped entries such as Infinitis G35 are pushing nearly 300 ponies, but they also dont tell the whole story. Most of the torque is available from about 1500 rpm and once you ram the gas pedal to the floor and wait just the tiniest moment for the turbo to kick in it rockets you forward in a most satisfying manner. My all wheel drive unit also sported a wonderfully smooth and slickly shifting 6 speed manual that was one of the nicest 6 speed sticks Ive driven to date. Every gear is easy to find and the ratios seem designed for the enjoyment of the driver. 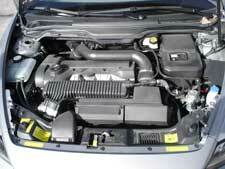 Other engine choices include a 170 horsepower 1.9 litre four banger and a 168 horsepower 2.4 litre five. Having driven the top line unit, however, I dont think Id want to hamstring this lovely performer by giving it anything less than the lovely top line engine. Likewise, you can also get five speed transmissions, either manual or automatic, but I sure liked that six speed! Ditto for the all wheel drive, which helps the S40 stick to the road like peanut butter sticks to the roof of your mouth. Base models come with front wheel drive. The cabin is a lovely place to do the job of driving, or passenging, very comfortable for four though a little tight in back for five  much like most cars of this size. 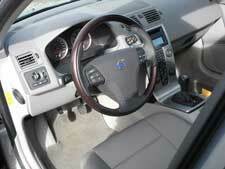 The drivers seat features the usual bevy of power adjustments and its easy to find a great driving position. I thought the left foot rest was a little too close, but thats where the front wheel well is so what can you do besides buy a larger car? The front seats in my tester were covered in a fairly nice grade of what seems like leather and came with bun warmers and memory settings. Theyre very comfortable and though it doesnt look as if theyd offer a lot of lateral support when I took the S40 on my favorite trek through the twisties near the Canadian Rockies they held us in better than we expected. The rear seat splits 60/40 and folds to let you carry long stuff in the trunk. This is good because the trunk was one of my two criticisms of the S40  it isnt large enough. My other quibble was the storage bins on the inside of the front doors: they might hold a pack of cigarettes but thats about it. Fortunately theres a lot of other storage available. And the thinness of the panel means theres room for a little storage platform behind it, out of the way yet quite easily accessible. Its the perfect place to put something you dont mind forgetting about, cause the little cubby is so darn cozy  and unique  that you could easily forget its there. The stereo, with the usual AM/FM radio tuners and 6 disc in dash CD changer, sounds very good. In fact, it thunders quite satisfactorily. It inspired us to crank up the remastered The Who Live at Leeds, and we were glad we did. Theres an abundance of speakers mounted throughout the cabin including a center front speaker designed to exploit the systems Dolby Pro Logic II capabilities. I dont understand why they wouldnt go all the way and play DVD Audio and dts DVD 5.1 music discs like Acura and others do. Those new audio formats arent doing well, unfortunately, but boy can they ever sound great! I tried a disc from each format in the S40 and it threw up its little electronic hands in frustration. The HVAC works well, the wipers do an excellent job of cleaning right to the drivers side edge of the windshield and the washers positively hose down the glass and headlights. Audio/cruise controls are mounted on the steering wheel as well and the simple, icon-based labels are nicely straightforward. That delicious engine/transmission combination is hooked into a car that uses struts up front and a multilink setup in its bum, with a nice ride thats comfortable and smooth, but compliant enough to let you still feel the road. The S40 sports four wheel power disc brakes, with ABS of course. I found the brakes a tad grabby; just think about stepping on the pedal and the Volvo stands on its nose. This took a couple of days to get used to, but in the end I appreciated the quick activation of the cars very good stopping power. The electro hydraulic, speed sensitive, power rack and pinion steering is tight and easy. The whole car is straightforward in feel and operation, maybe a bit sterile but certainly not unpleasant. I didnt really know what to expect when I got into this car. This was my first Volvo review and the last time I drove a Volvo it was my youngest sons first car, a moribund cinder block. The fact that that wreck was still on the road was probably a backhanded tribute to Volvo. And the companys safe, somewhat stuffy image built over the years didnt give much hope that this would be a fun car to drive. But it sure is! If this is Volvos entry level car, I cant wait to see what they consider upmarket.